SPECIAL GUEST ARTIST SET WEEKLY AT 7PM! Official start time is 8pm. 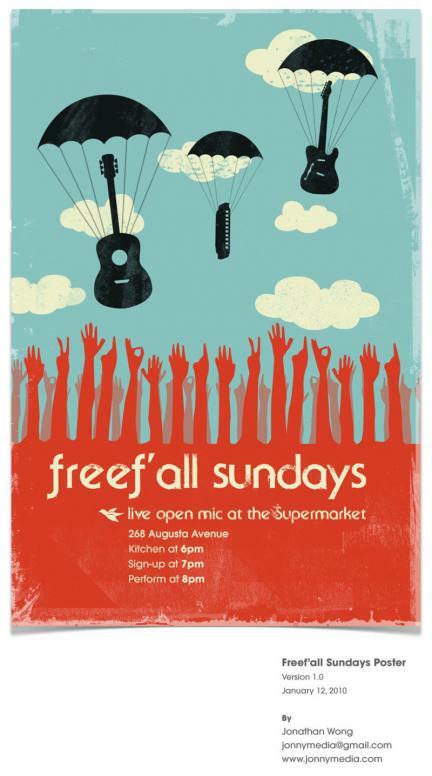 Doors open at Supermarket on Sunday at 5:30pm for dining and artists can sign up at 7pm. Artists get 2 songs (there are often between 30 – 50 performers each Sunday!) and can perform solo, or the hosts will “back you up” on drums, keys, guitar, bass, harp, etc. A house drumkit, keyboard, bass, acoustic guitar, and amps are provided for backline courtesy of Supermarket and Long & McQuade.